My son is becoming five soon... I'm hoping to teach him to eat a little chilli so that I can slowly introduce a variety of Singaporean traditional food. I'm hoping too that he can learn the roots of Singaporean culture through food. Unlike my son, my husband eat chillies like nobody business... LOL! I reckon this is the way we were brought up, training us to be extremely chilli-tolerant. 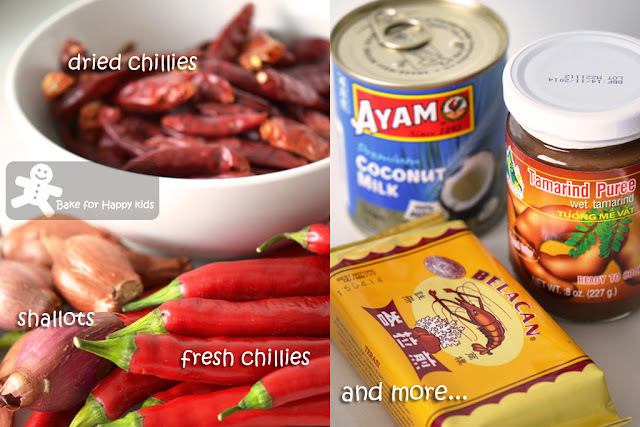 For us, I'm cooking two different sambal chillies in this post. One is the sweet kind with gula melaka (palm sugar). Another is the spicy kind with lots of chillies and coconut milk. Both are quite different in taste and level of its spiciness but equally delicious and fragrant when they are served with crispy fried anchovies, nasi lemak (coconut rice) or even plain rice! Two Sambal Chillies... Both are equally yummy! Blend dried chilies, fresh red chillies, onions and belacan (with little water - I didn't add this) till fine paste. Add in blended chilli paste into remaining oil, sauté till aroma. Add in gula Melaka, tamarind peel (puree) and salt, continue to sauté over low flame for 30 mins. Cook till half way, paste will become thick, add in water and continue cook (I didn't do that). Note: I fried mine for about 30 min until the sauce darken in colour and has nice aromatic fragrance and reckon that I didn't have to add water to cook further. Combined chilies with garlic, shallots and shrimp paste and pound to a fine paste. Add cooking oil to a heated wok. When oil is hot, fry chili paste and one-third of the milk over moderate heat until fragrant and oil bubbles through. Stir in seasoning ingredients and the remaining coconut milk. Lower heat and simmer for 2 mins. Remove to a bowl to cool. Instead of pounding the ingredients in fine paste, I have mixed all ingredients in a processor and process them into fine paste. The mixture were then fried for 30 mins with 1/4 cup of oil until fragrant. Divide into 4 portions, pack in plastic bags and freeze for future use. Each portion can be mixed with crispy anchovies and served as a side dish for Nasi Lemak. Remove heads of medium-sized anchovies. Wash and drain the anchovies. Heat cooking oil for deep-frying until very hot. Add the anchovies and fry over moderate heat until crisp and light brown. Lower heat at the end of cooking time to prevent it from turning too dark. Remove anchovies to cool slightly on a paper towel and store in a container. Thaw a portion of the sambal, heat through in a frying pan. 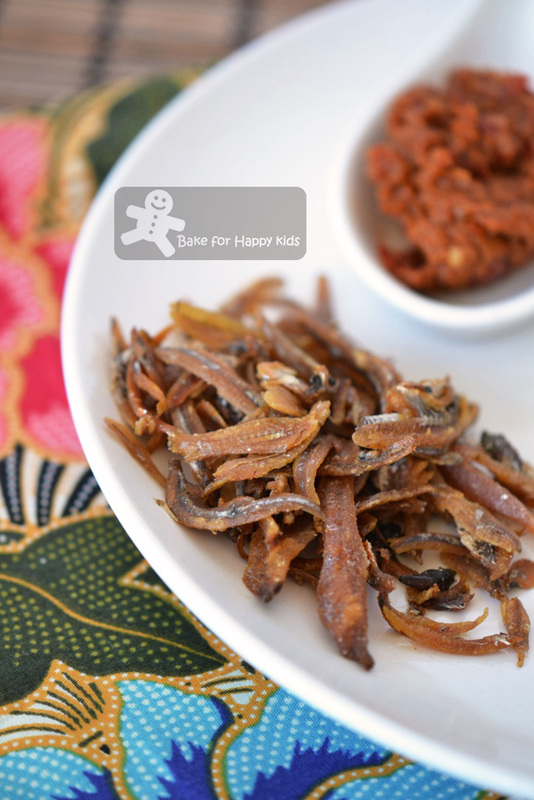 Combine sambal with crispy anchovies when ready to serve. I like semi sweet & spicy sambal.. Something in between.. When I get that in my nasi lemak bungkus (the ones pre-packed in mamak, on top of every table), gawd, I can eat 3 bungkus! Sambal is very important to me, I must have them in my rice, noodles, bread, karipap.. Oh talking anout karipap, I love karipap sambal + sardine.. I can eat 10. Yes, 10! By the way, dearie, I made your cream cheese brownie last weekend. Am gonna post about it in my next post. I love you Zoe. Even the hubs who doesn't fancy cakes (and other desserts) finished half and kept praising good + nicer than those in bakeries! OMG, can you imagine my happiness? I have a question Zoe. Can I use the same recipe, but add more flour (and baking soda), to turn this into a moist-chewy-gooey chocolate cake instead of a brownie? 10 karipop!!! You sure you can eat so much! I'm a big eater but can barely eat 5!!! ok ok your 10 karipop must be very tiny!!! LOL! Good luck with your chocolate cake baking! Thank you Zoe, I'm bookmarking this.. In fact, I already snapped the recipe with my phone and save it in my folder (yes, that's my way, I malas wana write down the recipes, so I just snap using my phone).. I'm so gonna make your hazelnut chocolate cake soon, minus the hazelnut coz I'm kinda allergic to nuts..
Btw, thank you so much for your lovely comment. I was a little grumpy this morning... feeling trapped in my usual routine but feeling good now after reading what you wrote :D You made my day!!! 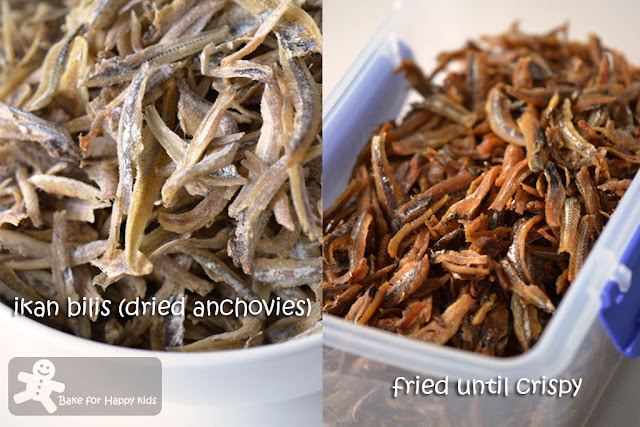 I like sweet sambal.... usually I blend the fried anchovies in. I guess you have to try and try till your son give you a thumbs up. Wah, long time didn't blog hop over your site. Now your talent is expanded in making sambal... My mummy home-made sambal paste is the best in the world. 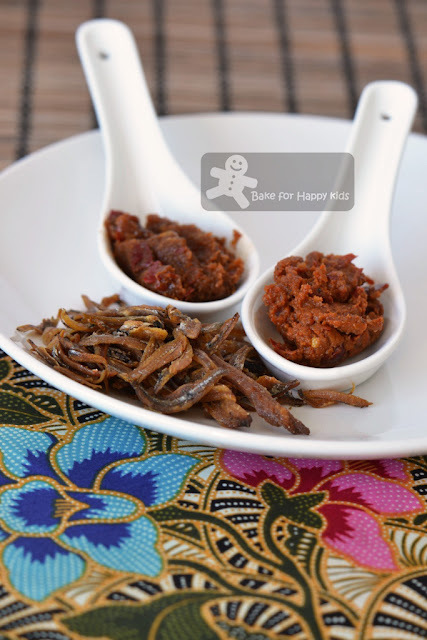 Sambal with anchovies really match make in heaven. Definitely great to have it on my nasi lemak dish. I introduced my 3 children to chilli when they were about your son's age. It was done with lots of patience and consistence.Now that they have grown up,only one of them can take chilli, the other two would not have chilli with mee pok, chicken rice or even French fries! Same as durian, even bribe them with $ and all three just cannot stand the smell. When there are lots of sambal and durian in my fridge, there is no raiding at night! I love the sambals, thanks for the recipe. Quick question , does all shrimp pastes taste the same? I mean I havent seen any belacan but noticed a small tube of thai shrimp paste, will that be ok too? I like spicy kind of sambal. And I can have cili padi dipping sauce. However, I seldom cook sambal as my kids and hubby can't take the heat. 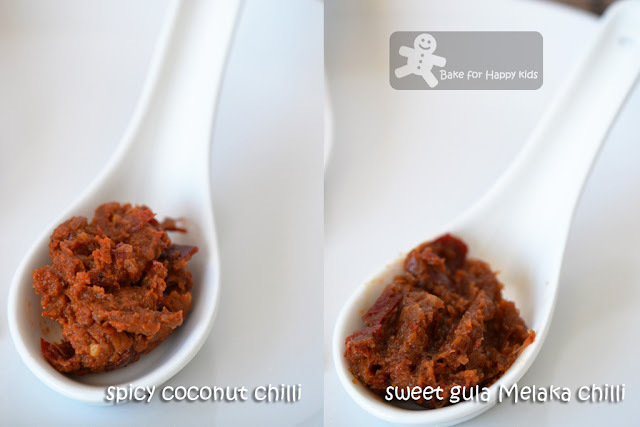 Hi Zoe, this is one of my favorite spicy sambal, thanks for sharing this recipe. I think it is so wonderful that you are introducing your son to different flavors and spices at such a young age, Zoe. I grew up tasting spicy foods at a very young age and I am so glad I did. I always told my children they didn't have to eat it but they always had to try it. Tastes change you know:) My daughter now tells my grandchildren the same thing, lol...I would gladly taste either one of these dishes and probably eat the entire thing! I try to introduce some spicy food to my kids too, and now my son can take a little spiciness and my daughter not so much! I remember when I was very young, I ate my rice coated with lots of sambal. And now, I eat chilli practically each day with my meals. Haha! Both your sambal looks good! I tend to keep away from sweet sambal. I like my sambal to be spicy and salty, especially when eaten with nasi lemak. I avoid the nasi lemak stalls that have sweet sambals! LOL! Both your sambals would make a nice sandwich with some sliced cucumber! Great for lunch! Oh, I won't mind to help you finish the sweet sambal. I can't take spicy food very well, so I guess my children won't be a chilli-lover like me. I have stopped seeing that gula melaka selling in my local grocery shop but thank God my friend has bought me one from KL. Oh wow love your home made sambal! Will try it sometime.